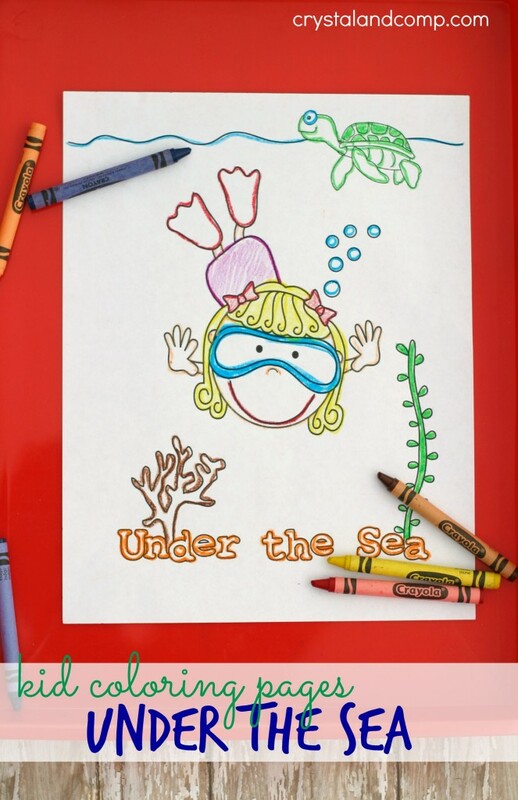 Are you ready for some fun kid color pages that are all about the ocean and everything that is under the sea? These are perfect as we jump into summer. Perfect to do at the kitchen table or in the car on a road trip! You know what I love about these? They are not just color pages, they also have handwriting practice for kids. Color, be creative and practice your handwriting all in one sitting! Let me show you what this 12 page packet includes. Print them all out and let the fun learning begin! We colored each one and talked about the things we could count or describe on them. Two big eyes on the jellyfish. Four long tentacles on the jellyfish. 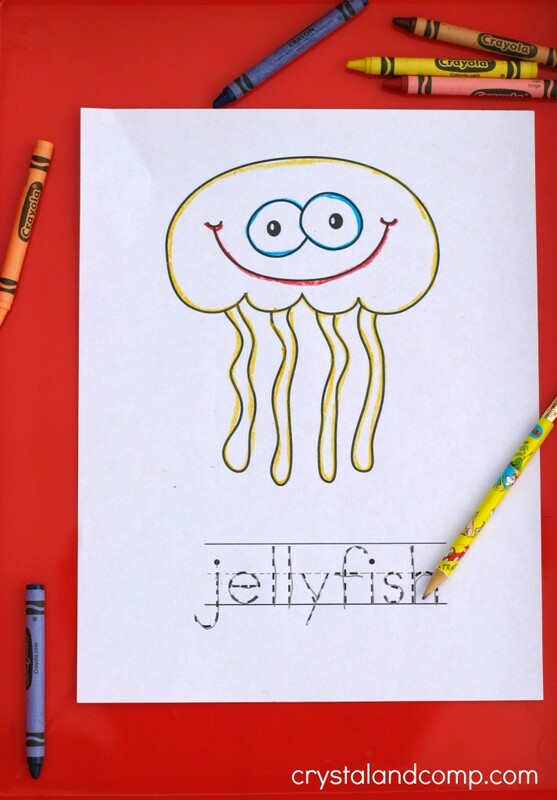 Two of the letter “l” are in the word jellyfish. Have them trace the letters of the word with their pencil. This is excellent handwriting practice and can serve as vocabulary words for an ocean theme! Which under the sea creature is your favorite and why? These are so cute! Thanks for sharing such an adorable, fun, easy summer idea for kids. I love it! Aubrey recently posted..Organization for Your Summer Bucket List Ideas in 15 Minutes! Aubrey- your sweet words made my day! I am so glad they are something you will use! Yay! I am so glad you love it. I hope your kids do as well. These are SO perfect for the writing practice my 5 year old needs this summer! These activity pages are AWESOME! Thanks for sharing at the After School Linky Party! I love these! How fun! I can’t wait to show them to my 4 year old. I would love it if you linked up this post at the Family Joy Blog Link-up Party which starts on Sundays at 12 EST on Ava’s Alphabet and 5 other blogs. Hope you are having a great weekend! 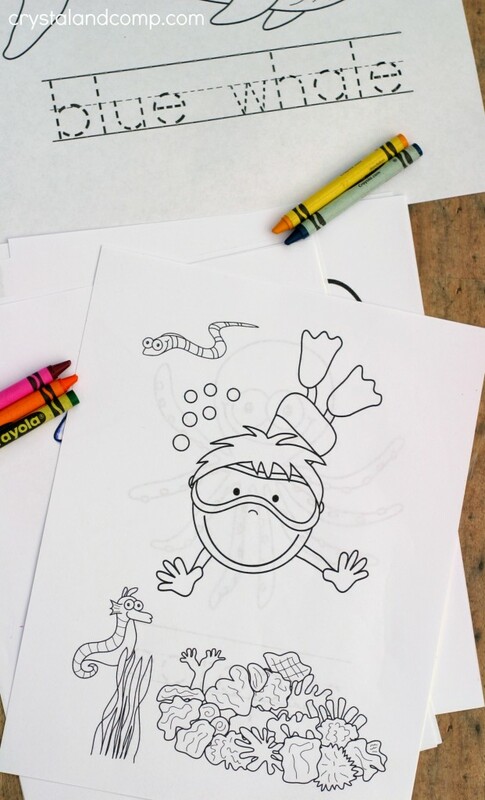 My 4 year old will love these coloring pages! Thanks so much for sharing with us at Share The Wealth Sunday! These are so cute and it’s great that you’ve made it into a whole learning experience! Great tips on the discussions!